Most Porsche fans know of other owners who sold a Porsche in the past, for one reason or another, and wished they could get it back. It happened to us (but that's a story for a later date). Unfortunately, for lots of different reasons, most of us are never able to get back the one that got away. Fortunately, for Kristin Russell's step father Dave, there's a happy ending to his saga. 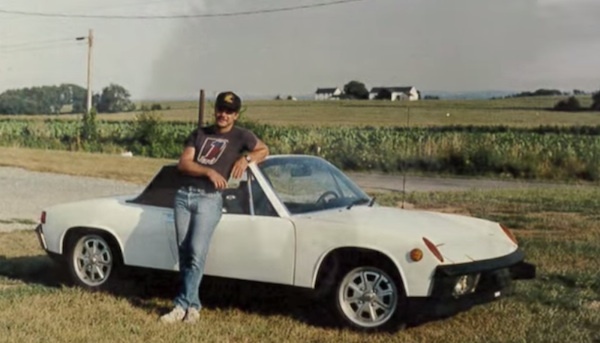 Decades ago Dave owned a 1973 Porsche 914. It was in rough shape, but he was saving money to restore it. Then he met Kristin's mom. Instead of using his hard saved cash to restore the Porsche as planned, he put it toward paying for the wedding to marry the woman he loved. Without his savings the Porsche languished in the garage and was eventually sold off for parts. Unbeknownst to Dave his step-daughter Kristin spent the last two years searching for a Porsche identical to the 914 he gave up to marry her mom. On Father's Day of this year Kristin surprised Dave with a card and the Porsche she found for him. Fortunately for us, she recorded the entire event and posted it to YouTube. Enjoy Dave's reaction as he realizes the Porsche in the driveway is his. Makes me realize how good an idea it was to hang onto my 356 for some 44 years when many demands nearly caused the sale. Mkes me realize how fortunite it has been that I kept my 356 for some 44years when many demands almost forced a sale. Its not a show car but a very nice driver. We’ve sold two (2) Porsches we wish we hadn’t. Would love to have them back. Good for you for holding onto the 356. I sold a 917, a 959 and a 962 to pay for my wedding. I hope my daughter’s reading this…. Great family values. Cool story.